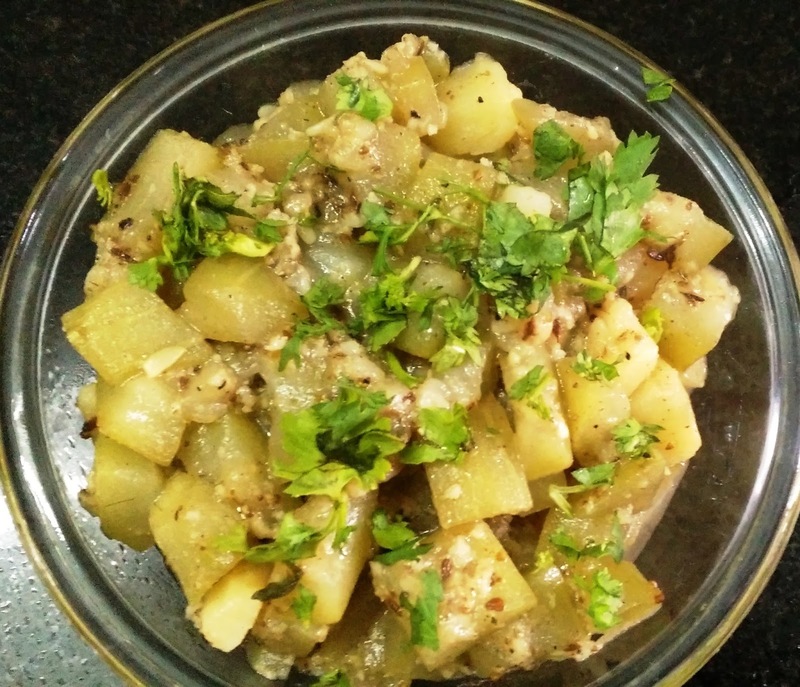 Simple, healthy & tasty Bottle guard bhaji cooked in milk !! 1. Add desi ghee in a heavy bottom pan or kadhai. 2. Add cumin seeds when ghee becomes hot. Add hing & whole paper corns. 3. Add bottle guard & potato pieces. Saute for 2 minutes. Add black pepper powder , red chilli powder & jeera powder. 4. Add milk & stir properly. 5. Add water & mix well. Cover the pan till lauki & potato cook properly. 7. Add sugar & salt. Cover the pan for 2 minutes. Add little water if required. Do not over cook. 8. Add fresh coconut & peanut powder mix & let it cook without covering the pan till bhaji becomes dry. Garnish with coriander.